Ahmed Hassan (18) had left a home-made made bomb on a District Line train last September. 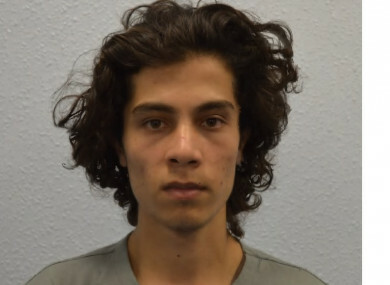 AN 18-YEAR-OLD man who left a home-made bomb on a London underground train has been jailed for a minimum of 34 years. Ahmed Hassan (18) of Sunbury, Surrey, was found guilty last Monday of attempted murder. Just before 8.20am on Friday 15 September, an improvised explosive device partially detonated on an eastbound District Line train at Parsons Green station. In all, 23 people were injured as a direct result of the explosion, with some suffering serious burn injuries. A further 28 people were injured in the resulting stampede as passengers fled the train and station in panic. Immediately afterwards, police launched an investigation to find the person responsible. The Met Police identified Hassan boarding the tube at Wimbledon Station from CCTV footage, and shared pictures of him with other police forces in the country. Hassan was detained the day after the attack at the port of Dover. Over the next few weeks, police managed to piece together his actions and movements in the weeks prior to the attack, and immediately afterward. Expert analysis of the device showed that it had been constructed with the intention to fully detonate, but had for some reason only partially detonated. Deputy Assistant Commissioner Dean Haydon said: “Hassan built a home-made bomb packed full of shrapnel that was designed to kill, maim and injure as many people as he could. It was only through good fortune that it didn’t fully detonate. Had it done so, I have little doubt that we would have been dealing with many fatalities. Chief Superintendent John Conaghan, from British Transport Police, said: “We thoroughly welcome the lengthy sentence that Hassan has been handed by the court today. In September last year, he put Londoners through a frightening ordeal when he left his home-made bomb on a District Line train. His appalling attack could have claimed many lives on that busy rush hour train. Thankfully, no one was killed and his imprisonment will prevent him from posing any further threat to the public. Email “London Tube bomber (18) sentenced to 34 years in prison”. Feedback on “London Tube bomber (18) sentenced to 34 years in prison”.